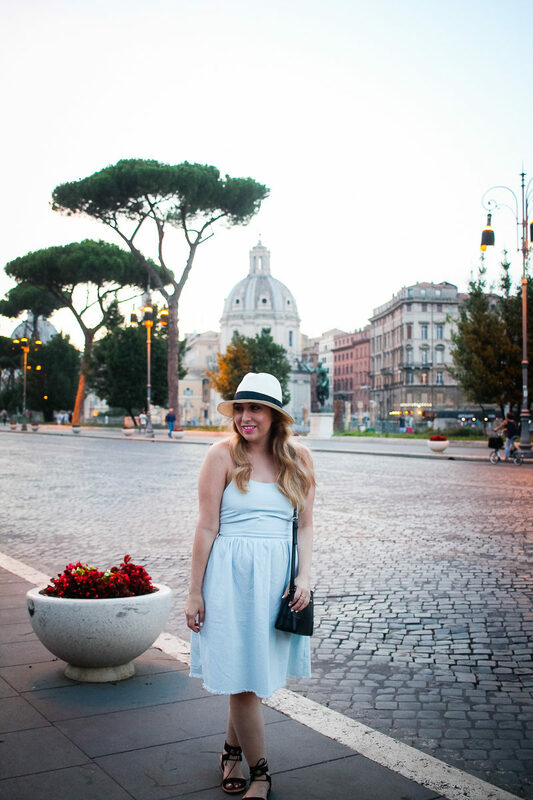 When we started planning our trip, we knew we wanted to do Spain and Italy. If you are planning a trip to a new location, check PharmaVaccs to see if you should protect yourself against any nasty surprises. As I started researching, what had originally started out as a Spain trip quickly evolved into a mainly Italian vacay. (Whoops, right?) 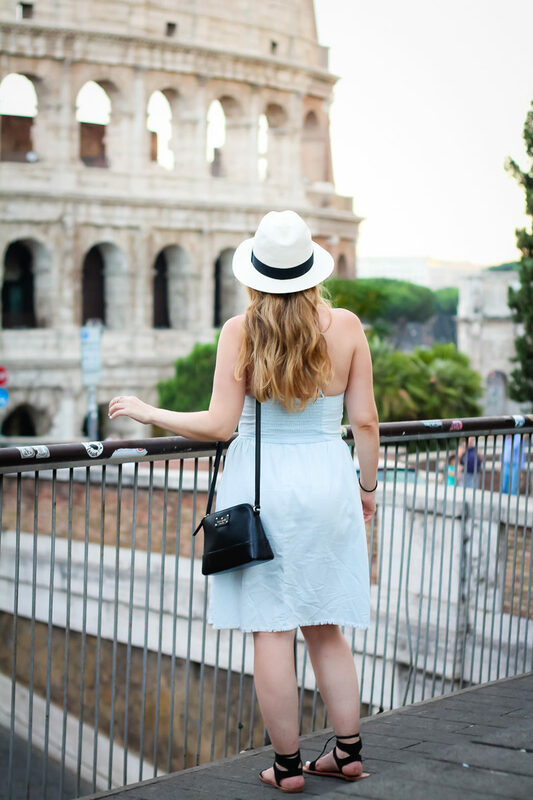 There were just so many amazing cities and places we wanted to visit in Italy, we decided to do 5 days in Spain and the rest of the trip in Italy. And we didn’t even make it to some of the amazing places I am dyyying to visit, like Capri. By the way– how fascinating is this? According to our tour, ancient cities had a real name and a secret name. The ancient Romans believed that if you knew someone or something’s name, you had power over it. Because of this, they always kept the real name of the city secret. 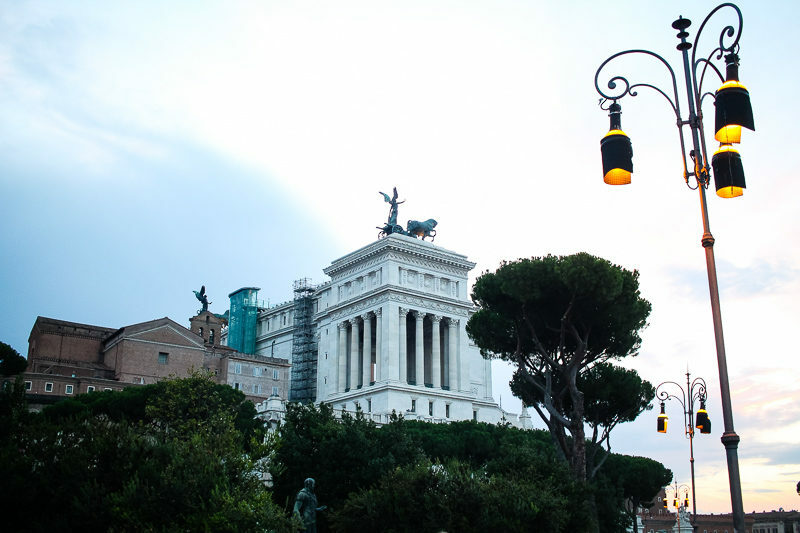 According to some stories, the secret name of Rome is really ROMA spelled backwards… AMOR. Isn’t that so cool!? No doubt Roma is super romantic! We flew from Barcelona to Rome on Vueling, again. (Sidenote: Vueling is owned by British Airways!) The flight was quick, only an hour and 45 minutes! Checking in at the Barcelona airport was actually kind of a pain… there was a HUGE line to check in and check your bags. Basically, when you get 30 minutes away from your flight, they make announcements and redirect everyone to another line to check in there. (Very stressful!) Only… the announcements are very, very hard to understand!) In any case, we made it. 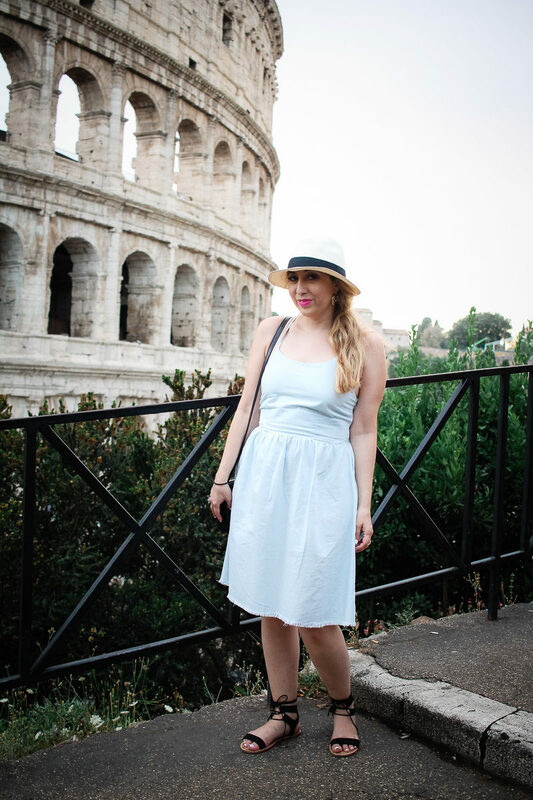 Rome was our very first Airbnb experience! I was more than a little nervous about trying Airbnb for the first time. I researched the apartments like crazy, reading all the reviews. My main concern was a/c. Seriously, I knew it was going to be 100 degrees. We’re Miami gals. We are USED TO CENTRAL A/C. There is no way that we could survive without a good a/c. That was our main criteria when selecting a hotel/Airbnb. 1) Do they fit all 5 of us? 2) Do they have good a/c? Now… the a/c was okay. NOT GREAT but okay. I think that might just be the name of the game in Rome, though. The buildings are so, so old. 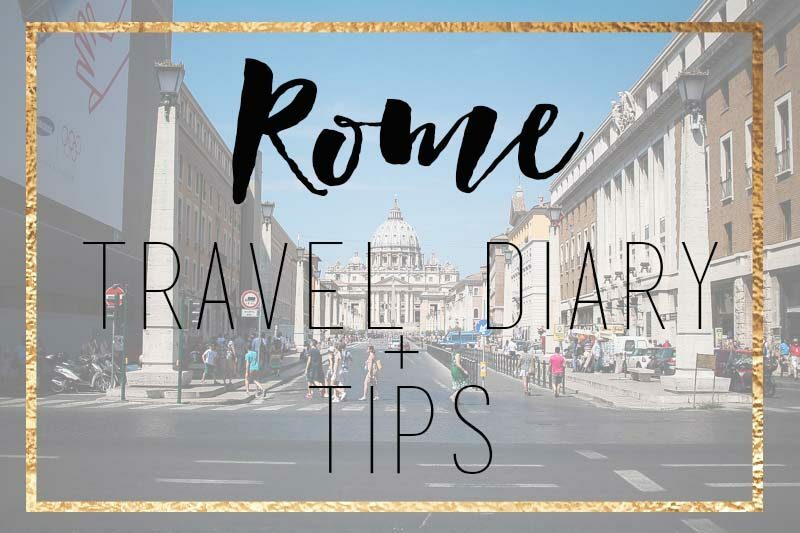 It was perfectly acceptable After pouring over review after review, we chose this luxury apartment, right on Via dei Polacchi in Piazza Venezia. The location was fantastic! We were walking distance from so many things and really close to one of the stops for the Hop On/Hop Off bus tour. The very first thing we did in Rome, no joke, was to get pizza. Jaime Cittadino from Sunflowers and Stilettos texted me a million amazing recommendations on where to go and what to eat before we left, and the very first thing we did was hit up her pizza recommendation. We headed to Dar Poeta in Trastevere and, guys… I ate the most amazing pizza I’ve ever eaten in my LIFE. I thought there was no way that I could eat the pizza they brought me, but I was wrong. I ate the entire thing. A huge pizza. All on my own. Not sorry. We once again started out by doing a Hop On/Hop Off bus tour, riding the full route once, and then a second time to actually hop on and off. Colosseum // This is probably a total no-brainer. 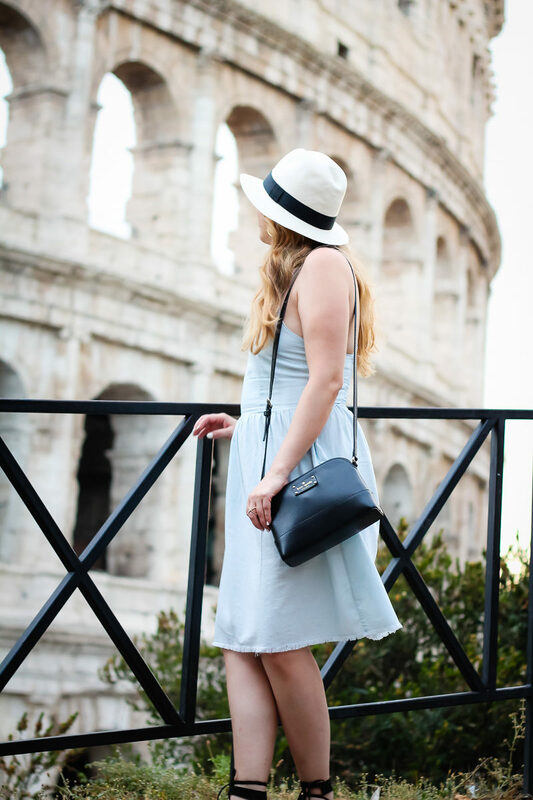 I was most excited to check out the Colosseum. Definitely, rent the audio guide, it’s totally worth it and chock full of fascinating information. I was so blown away while we were there and couldn’t even imagine attending an event there. I really just can’t imagine wanting to witness any of the brutality that the Romans passed off as entertainment. Pantheon / Roman Forum / Palatine Hill // the ancient ruins are just so fascinating to me. 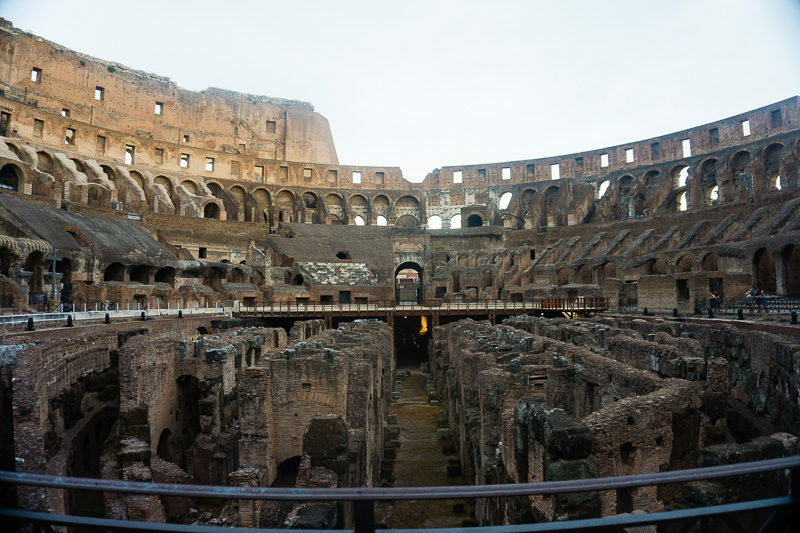 The Colosseum, Palatino, and Forum all have a joint admission ticket and it’s only 12€. Piazza di Spagna / Spanish Steps // We were SO disappointed that the Spanish Steps were closed once again for refurbishment. I dreamt of taking a photo with a gelato on the steps, a la Audrey in Roman Holiday. Total no go. I did, however, take a pic in front of the plastic partition because, YOLO. Trevi Fountain // the Trevi Fountain is the #1 must-do thing, in my opinion. 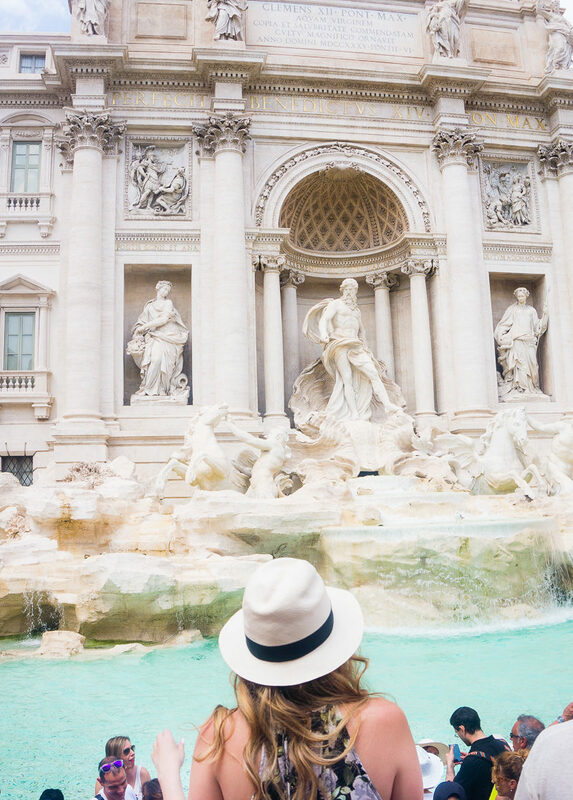 You know the saying… throw a coin in the fountain and you’ll definitely come back to Rome one day! (Which reminds me, I absolutely love the movie, Three Coins in the Fountain. It’s on Netflix. Also, now I have that song in my head. If you watch it, you’ll know.) But, I have to be honest. My blood boiled intensely. There were SO. MANY. PEOPLE. Which is fine, I get it, we all want our photo throwing a coin in the fountain. But everyone is SO RUDE. As a blogger, I get it. I get the importance of getting the shot and taking a beautiful photo. Because of that, I am SO respectful of other people when they’re taking pics. I wait my turn and then take mine. NOPE. None of that going on at the Trevi Fountain. I got pushed by, like, no fewer than 20 people and some lady and her hubby basically jumped into every single one of my photos. Uber fail. My best advice for hitting the Trevi Fountain is to do it early in the morning. LIKE EARLY. I wish I had done that. If we had stayed in Rome longer, I would’ve. Also, be careful because the street vendors are REALLY AGGRESSIVE. They come up to you and try to sell you things like water bottles, umbrellas, selfie sticks. (This is a major problem ALL over Rome!) They’re super aggressive and persistent… one guy, no joke, came up to us three times in less than 10 minutes! At the Trevi Fountain, though, they try to TAKE PHOTOS OF YOU and then charge you money!! NO THANKS. Piazza Dei Cavalieri di Malta // so this piazza is totally gorgeous and majorly Instagram-worthy. 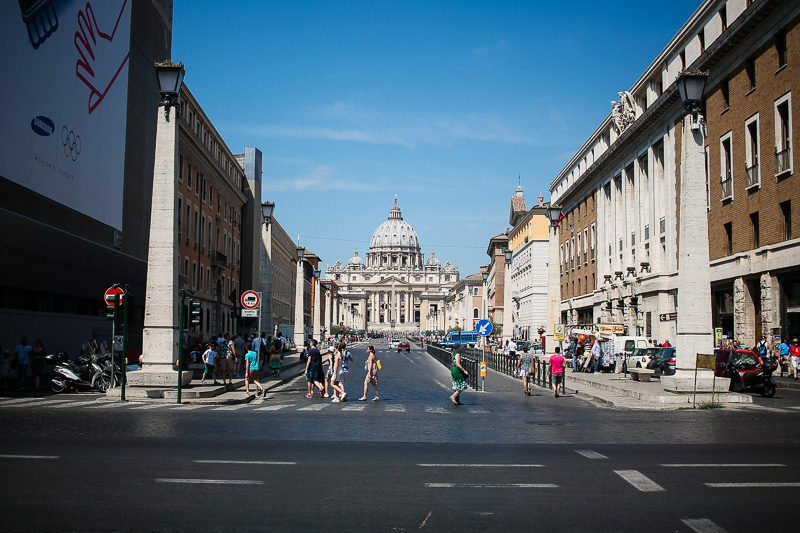 It’s a hedge lined avenue that is famous for its ‘secret’ view of St Peter’s Basilica. If you look through the keyhole in the Priorato’s main door, you’ll see the dome of SPB perfectly aligned at the end of the hedge-lined avenue. It’s GORGEOUS. Please don’t ask why I don’t have a photo of it. Just go. Via del Corso and Via Condotti // I mean. SHOPPING. That is all. Vatican Museum / St. Peter’s Basilica // You absolutely MUST see the Sistine Chapel at the Vatican Museum, it is STUNNING. Sadly, no photos allowed. It was amazing, no one is allowed to talk and everyone just stands in the room and stares up at the ceiling. Keep in mind that the dress code is very strict; you have to keep your knees and shoulders covered. Wear a midi length dress or skirt and keep a wrap or cardigan in your bag to throw on over. Dar Poeta in Trastevere // the best pizza in Rome. Duecentogradi // super long line for their delicious sandwiches, but move fast and are well worth the wait. Pastificio Guerra // this little spot is only open between 12-3pm. It’s basically a little window with the most delicious takeaway pasta. There are only two house specials offered each day, but the line will tell you something about the quality. Vinando // we ate dinner here our first night in Rome… we literally stumbled across it as we were looking for our apartment. The beautiful, twisty alleyways are gorgeous but way confusing! It was hot, hot, HOT! 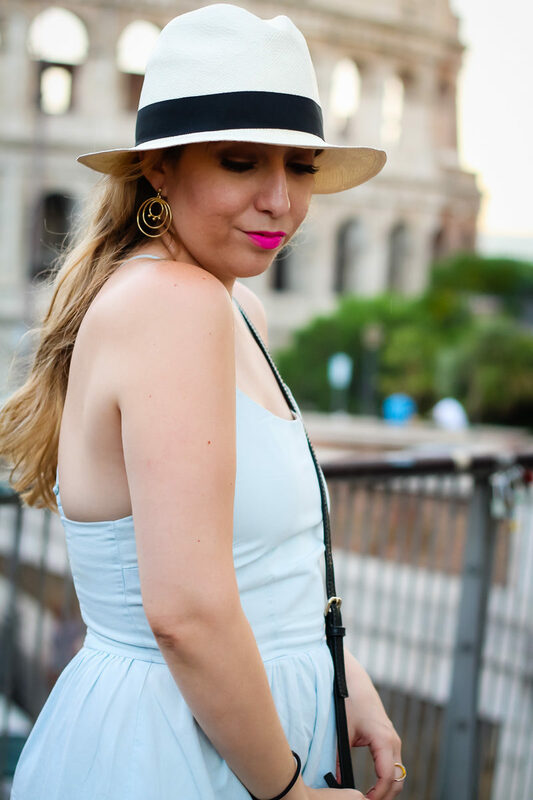 I choose easy pieces like lightweight rompers and flowy dresses, paired with sandals. The city streets are really dirty, just keep that in mind when you’re choosing footwear. 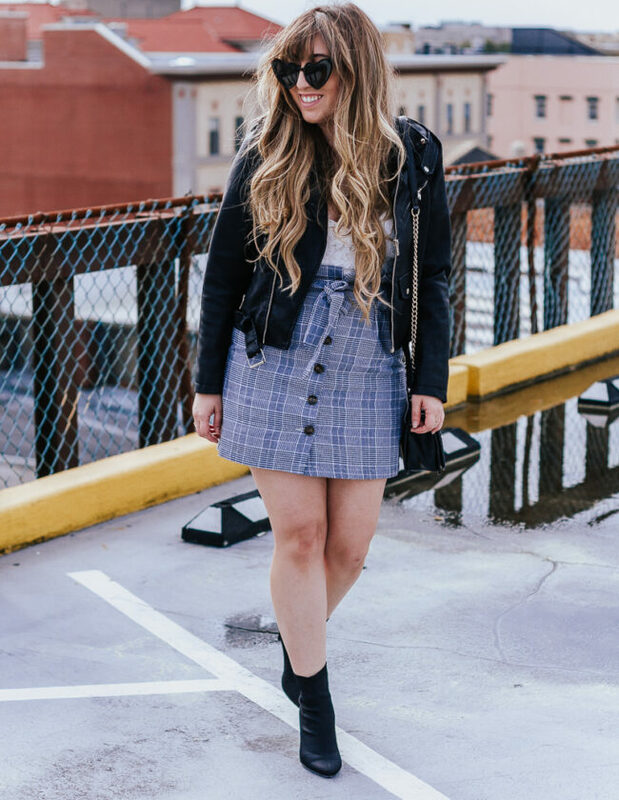 Our second day in the city, I did wear two different outfits. The first I didn’t shoot photos of, because it wasn’t really cute, to be honest. I hadn’t planned an appropriate outfit to wear to see the Sistine Chapel and St Peter’s Basilica, so I ended up wearing jeans, which I was actually weirdly really bummed out about. All the dresses I packed weren’t quite midi and didn’t cover my knees! I changed into this dress after and felt a lot better.